“Would the singer attempt to sing?” is a poetic question about deep human longing voiced mid-way through the second half of tonight’s concert. 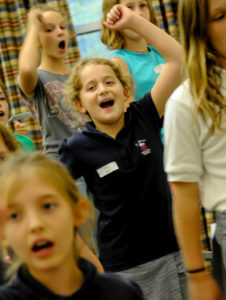 In addressing this question, Griffin Choral Arts looks to the tradition at Harvard University of appointing an eminent musician such as Aaron Copland or Leonard Bernstein as visiting Professor of Poetry in the understanding as old as Homer that poetry and music are not necessarily separate art forms but are at some deep levels one and the same. This profound truth can hold for all poems (which can be said to be “word music”–one of the reasons narrators are added to tonight’s presentation) and musical compositions. But it is especially the case with tonight’s concert, which may well be the most comprehensively unified program in GCA’s artistic history. While tonight’s two major works appear different on the surface, the number and extent of the “poetic” connections between them (the theme of processions, to name only one significant example) are truly amazing. 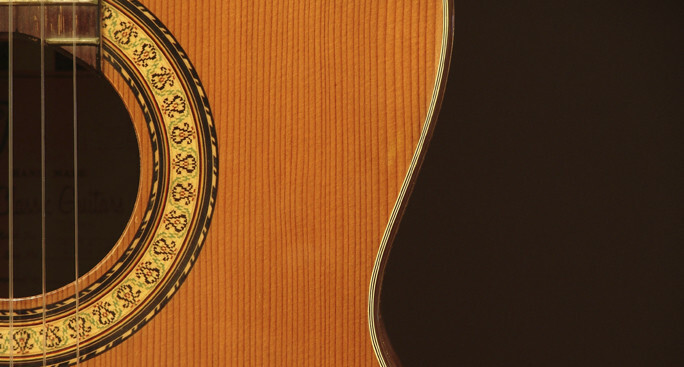 Tonight’s featured instrument–the guitar–is another important component of this pervasive artistic integrity. An ancient ancestor of the guitar (whose roots run deep in both myth and reality) was the Aeolian harp. Named after Aeolus, the Greek god of the winds, this instrument was played by the movement of ambient wind over the strings (thought to be the musical inspiration of the gods). Tonight’s concert highlights all of the features of the Aeolian harp: the stringed instrument (the featured solo guitar) and the inspired manipulation both of the strings (and even of virtually all the other physical parts of the guitar) and of the vocal instruments as they sing compelling lyrics that often comment directly on the interconnections among all these instruments. (As we shall hear, one of the concert pieces may even imitate the Aeolian wind.) The lush romanticism of Federico Garcia Lorca’s poetry in Castelnuovo-Tedesco’s Romancero Gitano and the searing laments of Walt Whitman’s Civil War poems in Jeffrey Van’s A Procession Winding Around Me are sure to activate our heart strings. Tedesco’s selection of particular Lorca poems also shows the composer’s effort to link the songs in the suite by prominent images and themes: the guitar, swords/daggers, liquid images (rivers/water/blood/ tears), processions, mystical female figures, and an overall elegiac tone of longing for completeness in the face of loss (though sometimes including hints of playful humor). In choosing the Lorca texts, Tedesco may also have been attracted by elements of the poet’s life, seeing similarities to his own. Although born in Florence, Italy, Tedesco’s ancestry traced to Spanish Jews who had been driven out of Spain in the late 15th century–along with the Hindustani peoples later called Gitanos or Gypsies and the (Islamic) Moors. This nomadic fate of expatriation would continue in Tedesco’s life, when he was forced to flee Fascist Italy for the United States in 1939. He eventually settled in Los Angeles, where he (like other Jewish composers such as Erich Korngold forced out by Fascism in Europe) contributed significantly to the Hollywood film industry, serving as a major influence on Henry Mancini, Nelson Riddle, Jerry Goldsmith, and John Williams. But he is equally highly regarded for his non-film music, of which Romancero Gitano is a prime example. In 1932, prior to his flight from Italy, Tedesco had met the famous Spanish guitar virtuoso Andres Segovia, for whom he wrote the first of his nearly one hundred guitar compositions. Lorca reflects in his poetry not only twentieth-century Imagist style but also the influence of oral folk narrative in its the feeling of “incompleteness,” in comparison to more formal poetry of the nineteenth century. Like much of his poetry, this is an elegy, a poem of mourning for loss, in this poem of Lorca’s sense that–poetically speaking–he could never “go home again” to his youth. Loss is also reflected in the images of towers and pools near the end of the lyric, referring to the fortresses and intricately beautiful rooms and courtyards of the Alhambra palace, built by the Islamic Moors before their expulsion from Spain in 1492. The three rivers are those named in the poem: the Guadalquivir, the Dauro, and the Genil. Tedesco selects this as the first lyric in the suite to establish the Andalusian geographical context. The water references find their counterparts in the liquid qualities of the music, both in the flowing solo guitar introduction and postlude and by having women’s voices and men’s voices sing in canon (round), thus imitating the pulsing flow of the rivers referred to. The “O Love” elegiac reflections are, appropriately, assigned to “lonely” solo voices. flows between orange and olive trees. descend from snow to wheat. that left and did not return! one of tears, the other of blood. that left through the air! on the waters of Granada. and wind in the orange groves. dead in the reflecting pools. When Beatle George Harrison wrote his famous “While My Guitar Gently Weeps” for the iconic 1968 “White Album,” he claimed to have drawn his inspiration from the Taoist Chinese I Ching meditation on the interconnectedness of all things. In some sense he could nearly as easily have used this Lorca lyric, though Lorca again infuses his meditation with even sadder elegiac longing. The “Heart mortally wounded by five swords” can be taken literally as the five fingers plucking the guitar, but it also can refer to the common image of the Virgin of Sorrows, whose heart is pictured in folk art as being pierced by swords. This image of the Virgin anticipates both the “dagger” lyric to follow and the statue on the float in “Paso,” following later in the suite. Musically, a quiet, andantino sadness is reflected in more homophonic (chord-like) writing, though still somewhat agitated by occasional reappearances of call-and-response canon. Not surprisingly, Tedesco instructs that this piece be sung with “ferocious movement.” The canonic voice entrances imitate dagger slashes. More homophonic chords stress the vehemence of the “No”s. Yet, lest we mistake this poem as mere sadomasochistic voyeurism, we need to remember the folkloric context: this is another poetic meditation on the common icon of the Virgin of Sorrows, whose heart is punctured by daggers. Don’t run it through me. The three chosen Lorca lyrics give poetic impressions of street festivals during religious celebrations of the Virgin Mary and of Christ. The first poem–“Procesíon”–expresses through the voice of the bass soloist a solemn, almost dreamlike anticipation of the feast of sights, sounds, and movement to come in the procession. “Ecce Homo” refers to effigies of the crucified Christ carried in the procession. “Enchanted Durandarte” alludes to a character in the Spanish mock-epic masterpiece Don Quixote, who, like the title character and even like Christ, was a victim of “foolish” love. “Orlando Furioso” is the title and main character of the early sixteenth-century Italian romantic epic by Ludovico Ariosto. As the title implies, this vignette is hushed, reverent, and sedately buoyant, much like the “floating” of the platform carried along the procession route bearing a statue of the Holy Virgin. According to Christopher Maurer, editor of the Collected Poems of Garcia Lorca, “The saeta (literally, dart or arrow) is a spontaneous, unaccompanied cry of devotion to the Virgin or to Christ, sung by those watching the all-night Holy Week processions, especially those of Seville. Lorca saw these for the first time in 1922 together with his brother and [with composer] Manuel de Falla” (896). The “lily of Judea” is an allusion to Christ, with the “incarnation of Spain” being a pun on the red of Christ’s wounds or the purple of his Passion robe. The feeling of watching the procession is unmistakable in the march-like tempo and wave-like canon effects among the voices and the guitar. The type of dance known as baile is common for female dancers in the flamenco tradition. In keeping with Lorca’s dominant style of observing life as a kind of procession of impressions rendered almost as if a tour book guide through a museum, this vignette describes not a real-life event but the scene depicted on an old woodcut or engraving. It fits in well with Tedesco’s own “Pictures at an Exhibition”-like structuring of the musical vignettes drawn in sympathy with Lorca. The tempo is of the Seguidilla dance, even imitating the sounds of castanets in the female voices over the opening baritone solo. The faster tempo alternates with much slower largo passages, in which the dancer’s expressiveness–especially with her hand and arm movements–is spotlighted. through the streets of Seville. of swains of other days. As Lorca editor Christopher Maurer indicates, “Crótalo is an ancient name for the castanet, and almost certainly has that meaning here. Crótalo can also mean rattlesnake.” (898). The sounds of the essential flamenco percussion instrument are clearly indicated by the rapid cross-rhythms in both the voices and the guitar, alternating with later sections in which the sinuous body movements of the flamenco dancer are imitated in arch-contoured melodic lines sung in canon. Despite their many superficial differences, there can hardly be a better companion for Castelnuovo-Tedesco’s homage to Garcia Lorca and the flamenco tradition than Jeffrey Van’s meditation on the Civil War poetry of Walt Whitman (1819-1892). The number and nature of their similarities are striking even beyond the obvious identical instrumentation for solo guitar and mixed chorus: both composers seem almost supernaturally empathetic with their source poets’ themes and very language; both incorporate the guitar as an important poetic theme (Tedesco more obviously than Van, but the latter’s implied reference to the featured instrument is still thematically important); both focus on the theme of processions as a structural device; both look cleared-eyed at even the most disturbing and tortured aspects of their themes and their source-poets’ treatment of these themes in their work and in their lives alike. It can even be said that a concert such as tonight’s featuring these two works has discovered the “Yin and Yang” complementarity between the two compositions. Performer and composer Jeffrey Van is among the most prolific and widely recognized leaders in the world of the guitar. He has appeared in Carnegie Hall, famed Wigmore Hall in London, and the Kennedy Center in Washington DC. He has often recorded with the Dale Warland Singers, and has served as teacher to Sharon Isbin and members of the Minneapolis Guitar Quartet. He is a member of the faculty of the School of Music at the University of Minnesota. Of tonight’s work, the composer has written, “The unwitting genesis of this work was an unexpected visit to the battlefield at Gettysburg in the summer of 1989. The richness and depth of that experience can only be hinted at in words. One year later, when the Lancaster [Ohio] Chorale commissioned me to write a work . . ., I was drawn to Whitman’s poems and selected these four from his DRUM TAPS of 1865.” (https://events.umn.edu/prod/groups/public/@pub/@cla/@mus/documents/eventfile/008993.pdf). Like Tedesco, Van selects and re-arranges poems from his source author. Whitman wrote a large number of poems reflecting on his impressions of the Civil War, but Van selects four in order to establish (as economically as possible) a time line–emphasizing the title image of procession–from quiet anxiety before battle (“By the Bivouac’s Fitful Flame”), to a martial mood as in actual combat (“Beat! Beat! Drums!”), to a numbed bare-consciousness at witnessing the carnage after the battle (“Look Down Fair Moon”), to a final emotional reflection (“Reconciliation”) on the overall drama just witnessed. Of special note not only in this poem but throughout the suite is Van’s ability to fit–hand-in-glove– the inherent musicality of Whitman’s ordinary-yet-elevated diction to rhythmic cadences of his own. Van also draws immediate attention to the flamenco-like uses of the guitar as a percussion instrument even beyond the use of its strings. This heightened attention to the guitar, while not so obvious as in Tedesco’s choice of Lorca poems about guitars, is still a clear (though understated) reminder that guitars were surely in common use among Civil War soldiers, perhaps especially in the bivouac campfire scene like those Whitman depicts. While Van positions this poem second in his “processional” dramatic order, the poem was actually one of Whitman’s earliest, written in 1861 when the excitement at the prospect of war had not yet fully sunk into the general awareness of the true horrors to be caused by that war. The “fit” between the words of Whitman’s battle cry and Van’s rhythmic phrasing is airtight. Van also increases the “word and sound painting” of his musical effects both in the vocal lines and in the additional exploration of the percussive abilities of the guitar body and components. So fierce you whirr and pound you drums–so shrill you bugles blow. No bargainer’s bargains by day–no brokers or speculators–would they continue? Then rattle quicker, heavier drums–you bugles wilder blow. So strong you thump O terrible drums–so loud you bugles blow. The tender desire for the bathing of moonlight almost certainly reflects Whitman’s service as a nurse in Washington war hospitals. Of special musical interest is the introduction of whistling by the male singers. After three such passages the guitar finally echoes the whistled melody–perhaps Van’s own hint of the Aeolian harp mythic motif. Pour down your unstinted nimbus sacred moon. If the Irish poet William Butler Yeats was correct in suggesting that beauty can be “terrible,” Van’s selection and setting of this final Whitman poem are almost unbearably beautiful–in the ways that only the best poetry and the best music can communicate beauty otherwise impossible to convey or even to understand in “normal’ or “common sense” experience. As if to reconcile our emotional pilgrimage through the four Whitman poems Van has the guitar recall faint echoes of the “Bugles! blow!’ melodic theme from the second song in the cycle. More “terribly beautiful” still is the final image that helps bring full circle the image of the bugle (played by the lips) that heralded both the start of the war and its emotionally chastened conclusion. In confronting the incomprehensible, in answer to Whitman’s question “Would the singer attempt to sing?” we can take him (and Van and Lorca and Tedesco) to mean all musicians and poets. In the face of the inexpressible, the attempt is all. Spanish-language quotations and English-language translations © Herederos de Federico García Lorca from FEDERICO GARCÍA LORCA: COLLECTED POEMS, edited by Christopher Maurer. Farrar, Straus and Giroux (New York rev. ed., 2002). Used by permission.